Hiroshima Day is a grimful reminder of what could have been prevented. Our discussions on it in a classroom usually revolve around aggression, suffering, destruction & death. Here are three stories (and few more) that remind us the necessity of hope & peace even in this tragic event in world history. A 12 year old Sadako Sasaki is the inspiration. "When America dropped the atom bomb on Hiroshima during the Second World War, Sadako was only two years old and too young to remember the bomb. She lived a mile away from Hiroshima, so nothing much happened to her, although more than two hundred thousand people died in the holocaust. After the reconstruction of Hiroshima, Sadako began to attend school. Sadako was now eleven years old. One day while she was practicing for the relay race she fell down unconscious. She was immediately rushed to the hospital. The doctors found out that she had leukemia - a sort of blood cancer. Lots of people had earlier died of this disease by radiation. Sadako was admitted to the hospital. She felt afraid because she knew that everyone who had got this disease had died. Sadako wanted to live. She did not want to die. One day her best friend Chizuko came to see her. She had brought with her some squares of white paper. Chizuko took a paper square and folded it into a bird - a beautiful crane. She told Sadako that the crane was sacred to the Japanese and that it lived for over a thousand years. She told her that if a sick person folded a thousand cranes she would surely get well. Every day Sadako tried to fold the cranes. But the disease left her very weak. On some days she would fold twenty cranes while on some other days she could fold only three. Sadako knew that she would not become all right but still she was determined to fold the cranes. On one particular day she could manage only one. But she kept on making cranes until she could not make them anymore. She folded 644 cranes. 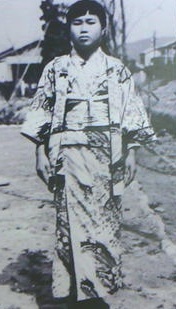 Sadako Sasaki died on October 25, 1955. Her friends folded the remaining 356 cranes. Her friends admired her brave and hopeful spirit. Sadako's death made them feel very sad. Her friends collected money to build a monument of PEACE AND LOVE in the memory of Sadako. This monument is called the Children's Peace Monument, and is in the Peace Park, right in the middle of Hiroshima, where the bomb was dropped. The statue depicts Sadako standing on the Mountain of Paradise, holding a golden crane in her outstretched hands." The second one is an art project Jeffrey Brown created to memorialize Sadako Sasaki. Contained within the fragile wings of these 2000 paper cranes is the portrait of Sadako Sasaki. A child victim of leukemia from the atomic bombings of Hiroshima, Sadako folded paper cranes as a means to become well again. She eventually lost her battle from a disease caused by a war that was no fault of her own. Drawing from her dedication to overcome adversity and born from the hope to memorialize and inspire, each grayscale crane serves to allow Sadako's story of perseverance and optimism to live on. A single origami crane stands true as a universal symbol of peace, but when folded and grouped into larger quantities, their overwhelming inspiration seems to flourish. Although hatred and greed abundantly affect much of our world, it seems that compassion and empathy are spread thin. These emotions, be it love or hate, are universal, and not exclusive to any one creed; their potential lives inside everyone. This message is echoed in the fact that a folded origami crane can blossom from any hand. It is hoped that the solemn stare of the girl that materializes from within the careful arrangement of folded paper helps the viewer to reflect on the potential that lives inside themselves. Here is moving adaptation of Sadako's story by Elizabeth Duong, a short film to raise awareness for Leukaemia.